1. If you had a pet, what do you need to do to take care of it? 2. Why would you need to do more for your pet than just give it a hug once in a while? 3. What kinds of dangers are there on a busy street? 4. Why shouldn’t you cross the street by yourself? 5. Why do you think a big truck or snowplow wouldn’t be able to see you if you were outside by yourself? 6. What do you think is a safe place? 7. What do you think is an unsafe place? 8. What do you think could happen if Timmy couldn’t get Boo out of the tree? 10. What do you think makes a pet feel safe? 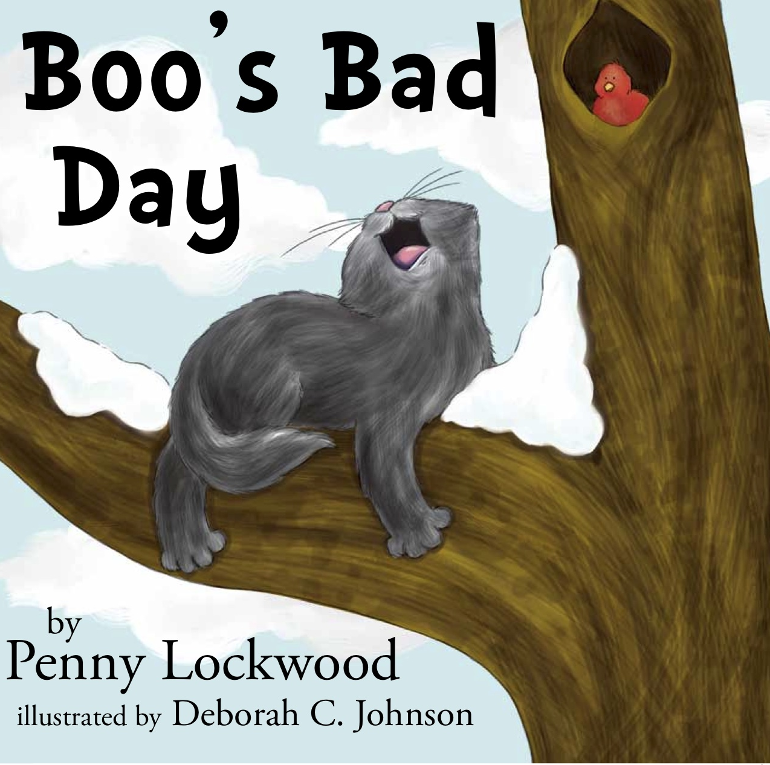 In Boo’s Bad Day, Penny Lockwood presents a sweet story which is a delight to read aloud. Small children will love the kitten and his adventure. They will understand the delicate message that home is the safest place to be. Deborah C Johnson’s beautiful illustrations show us Boo’s miniature world and I loved the changing expressions on Boo’s face. Boo’s Bad Day is a quality children’s picture book, one to snuggle into with your favourite child. 5 stars. This a wonderful story about Boo the kitten who sits by the window watching the bigger cats play in the snow outside. He wants to go and join them and his chance comes when his owner Timmy comes in the door. Unfortunately the outside world is not as wonderful as Boo expected it to be. After reading this book I wished I knew children who were the right age to read it. I was fascinated by the story and illustrations, and believe it will catch and hold young children's attention. The author makes no attempt to humanize Boo. He acts and purrs like a kitten when he is happy, and meows loudly when he is frightened. His owners love him and he loves them. The only reason he got into trouble was because he was bored. Is there a message for young people there? Well done and thank you Ms Lockwood for writing a gorgeous book. You also picked exactly the right illustrator for your story. Congratulations. After a series of new life events, Boo discovers that there is no place as safe as home. with illustrations that are equally wonderful. “Boo’s Bad Day” by Penny Lockwood is a short tale about a kitten who, after watching outside through the house window for hours, decided he wanted to go outside to play, like the other animals. He was just plain bored of playing with his toy mouse. But poor Boo was too little to open the door by himself, and nobody else was home. So Boo went back to his window sill to watch outside some more. Then he sees Timmy and his mom drive into the driveway, so he waits by the door to sneak outside when they come in. But as Boo was soon to learn, outside was not as attractive as it had at first appeared. There was a lot of snow out there; would Boo freeze to death? There were big trucks and dogs out there. Would Boo get run over or bitten? There were all kinds of things outside that Boo hadn’t considered from his window sill in the nice, warm house. This is a very short story for young children. Although primarily written for entertainment, it does have a lesson to it: don’t be too impatient about growing up; just enjoy being little while you can. The illustrations are nicely done, and complement the text well. This is the sort of story your toddler may latch onto and never want to let go, insisting you read it to them at bedtime, night after night. Though you may wish they’d pick a different book once in a while, treasure those moments. This book teaches the little ones to just enjoy being little while they can. That goes for their parents, too: enjoy them while they are little, while you still can. Before you know it, they’ll be reading to their own kids at bedtime. A Beautifully illustrated picture book that illustrates the story of a kitten and his excursion out into the snow. This sweet little kitten knows he is supposed to stay inside and yet ventures out anyway, determined that it simply must be more interesting outside. He is frightened by what he finds though. Big huge trucks with their loud noises and a scary dog barking finally send him up a tree. When a little boy comes to rescue him and take him home. Boo (the kitten) finally realizes that just because something looks more fun does not mean it is better for you. A perfect indirect lesson for kids! Boo's adventure...keeps a light-hearted cadence and promotes a message that the good feeling of security is sometimes buried under the stifling agitation of boredom. I’ll admit it, I’m an adult and I still read children’s books. Sure, I pretend that I do so for research purposes, but it’s not true, not by a long shot! Children’s books take me back to that simpler time before the world got complicated. You know the time before we had bills, responsibilities, and worries. I recently had the privilege to review Penny Lockwood’s newest children’s book, “Boo’s Bad Day” a story about taking on more than you can handle. Boo is an adorable house kitten who’s never ventured outside before. Even though Boo believes he’s ready to take on the world, he is forbidden to leave the house by his humans. And with good reason, because the second he decides to disobey, he finds himself in big trouble. Boo's Bad Day is a cute picture book for kids that demonstrates in a fun way about obeying and listening when an adult tells you no. Boo wanted outside in the worst way, and didn't see the harm in sneaking outside for a bit. The story shows all the trouble Boo gets into while outside as a kitten too young to be out on his own. Parents will enjoy this book as a bedtime story and a great spring board for teaching children about obedience. It is a cute story with a happy ending yet has a great life lesson threaded throughout with great illustrations that enhance the text. The author has done a great job of endearing Boo to the reader and showing children the consequences of going against what they have been told without being condescending. This is a must to add to your child's library to be read over and over. A nice read for young kids that raises awareness of pet care and the dangers that surround us outside of the home. The cute illustrations were loved by all of us. Boo’s Bad Day by Penny Lockwood is beautifully illustrated and well written picture book. The words and pictures go hand in hand and it makes a delightful tale, with a couple of lessons for children to learn (I have included some Teachers and Parents Talking Points at the end of the review, provided by the author, to go into these lessons more). Boo is a kitten who is bored and he manages to find a way outside and is confronted with many things that make him scared. He ends up in a tree, very frightened and his owner has to coax him down. At the end of the book, we see the kitten content at being indoors again having learnt from his outdoor “adventure”. Hazel loved the pictures and being read the story. She loves her animal books and has this lovely delightful noise she makes for a “miaow” (she sticks out her tongue and waggles it making a sort of mewing noise), which makes Mum read it to her more, as she loves to hear Hazel do her “miaow”. Hazel has plenty of outside adventures, but Mum or Dad are always very near by to cuddle her or comfort her when there are loud noises, or new things to take in. Boo is a house cat on a snowy day. He wishes he could go outside and play with the other cats. When his wish comes true, will Boo's adventures lead him into trouble? Boo's story is one young children can related to - what do when it gets boring. Boo makes several choices that will help teach young readers the value of making good and bad decisions. The illustrations are endearing and whimsical, perfect for the story. Overall, Boo's Bad Day is a heartwarming story with a strong lesson about making good choices. The story appeals to children between the ages of 2-6. I highly recommend this book. I've had the opportunity to read this book, and as someone who's been owned by many cats, I loved it immediately. Written in short, simple sentences, this is a perfect book for beginner readers, as well as kids of all ages — even big ones like me. Deborah C. Johnson did a beautiful job illustrating Boo the kitten, as well as all of the exciting adventures he endures with her bright, vibrant, action-filled pictures. I love the cover. It reminds me of my cat, Denny. Boo’s Bad Day is an adorable story of one kitten’s adventure. Boo thinks being inside is boring, so when Timmy and his mom open the door on their return home, he sneaks out for a bit of excitement. He soon discovers, however, that the outside world is a scary place filled with loud noises and scary situations that make the inside look mighty inviting. As I thought about this story, I realized that Boo is no different than a young child who wants to explore new things and then discovers the safety and comfort of normal everyday situations is good too. Written for children from ages 18 months up to six years, this charming adventure story engages and entertains. Lockwood’s prose indicates a knowledge of her intended market; and the simple text will help as youngsters transition from being read to, to reading independently. The colorful artwork by Deborah C. Johnson is a delightful complement to Lockwood’s story. Children will enjoy watching the emotions play across Boo’s face from beginning to end. Boo’s Bad Day is a wonderful book that I am thrilled to have as part of my children’s library. I have read this book and have to say it is quite enchanting, from the storyline to the delightful illustrations. Boo a bored small kitten who longs to explore the great outdoors. The story line is just right for children being read too and also for those who are spelling out books for themselves. The illustrations are beautiful, very simple, and full of colour, movement and expression. Boo's Bad Day by Penny Lockwood is a fun read - I almost wished I had a young child! Boo is a kitten who is curious about the world outside, but once he sneaks out he discovers it isn't what he was expecting. . . . The story is based on a similar event with one of Ms. Lockwood's own cats and, fortunately, both stories have a happy ending. Boo learns a few lessons during his adventure which children will be able to easily grasp. The cute illustrations convey the story without being scary and the lessons are learned without being preachy. Another thing that I like is that it is short. When my son was at this age, it was difficult to find an enjoyable children's book that was short enough to read at bedtime or when he needed to be entertained "just long enough."